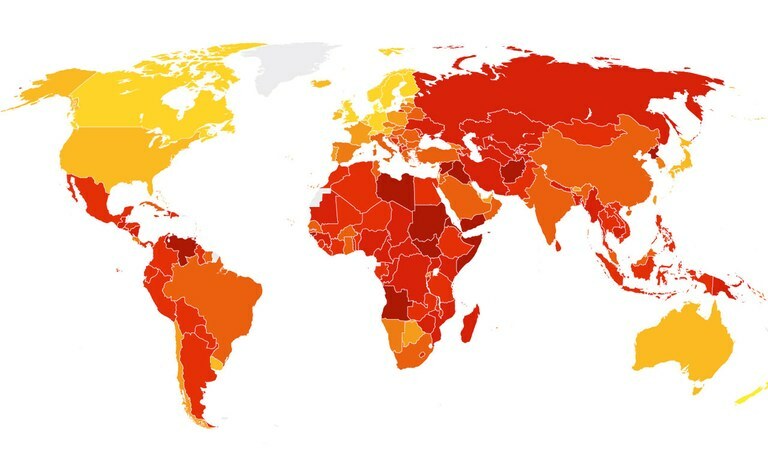 For the 5th year in a row Denmark is the least corrupt country in the world according to Transparency International's annual Correption Perception Index. According to the President of Transparency International Denmark this is among other things because the Danish society is built on a high level of trust. No country gets close to a perfect score in the Corruption Perceptions Index 2016. Ukraine shows a minor improvement by 2 points on this year’s index. This can be attributed to the launch of the e-declaration system that allows Ukrainians to see the assets of politicians and senior civil servants, including those of the president. However, cases of Grand Corruption against former president Yanukovych and his cronies are currently stalled due to systemic problems in the judicial system. In many countries of the region, insufficient accountability has generated a perception of quasi-impunity of political elites, and the current wave of populism over Europe seems to enable legalisation of corruption and clientelism, feeding the extreme power of wealthy individuals that steer or own the decision making power. Corruption scandals have also hit a number of EU countries. Last year in Denmark, the top country on the index, 20 members of the Danish Parliament (11 percent of 179 members) did not declare their outside activities or financial interests in their asset declarations. In the same year, Dutch members of the Police Works Council resigned following an investigation that revealed how a significant amount of the Council’s money was used to pay for expensive dinners, parties and hotels. This is highly alarming. When core institutions in a democratic society – political parties, parliament, public administration and the judiciary – are systematically implicated with corruption, they cease to be regarded as responsive to people’s needs and problems. Integrity in politics is key to fighting against corruption. In the Western Balkans, Transparency International’s recent report attributes weaknesses in law enforcement to captured political systems in which politicians wield enormous influence on all walks of public life, while being close to wealthy private businessmen or even organised crime networks. Capture of political decision-making is one of the most pervasive and widespread forms of political corruption in the Commonwealth of Independent States (CIS) region, where a culture of impunity prevails among politicians, prosecutors and oligarchs. In many CIS, EU accession and Eastern European countries, it is common to have MPs or local governors who are also business owners, without being questioned by the public, which perceives this as something normal. Companies, networks and individuals unduly influence laws and institutions to shape policies, the legal environment and the wider economy to their own interests. In this case having a comprehensive legal framework is not enough. What is required is effective implementation of anti-corruption provisions. In countries where political decision-making is not captured, it is very important that governments assess risks in everyday decision making and administrative procedures, identifying possible gaps in order to act preventively, improve controls and to regain the trust and confidence of their citizens.